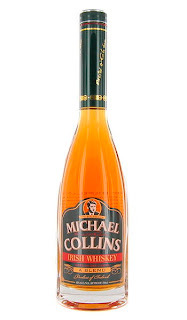 Named after one of the leading figures in Ireland's successful struggle for independence and the first chairman of their provisional government until his assassination in 1922 (How about that for a run-on fragment; large as the man himself), Michael Collins Irish Blended Whiskey has a make-up similar to a Scotch blend. The vast majority of Irish blends contain a portion of triple-distilled pot still whiskey (from a mash of malted and unmalted barley) and grain whiskey. Like a Scotch blend, Michael Collins is a mix of double-distilled single malt and grain whiskey. The Cooley distillery specializes in single malts as opposed to the single pot still whiskey coming from the Midleton distillery. They make a number of very different single malts (two reported on here and here), from the Connemara peated brands to the unpeated finished Tyrconnell whiskies to a Michael Collins 10 year old to a number of small independent bottlings. So this blend is structurally different that Powers, Jamesons, Paddy, and Tullamore Dew. Is it better or worse or similar...? The nose is a bit difficult, but the palate is nice. Very easy drinking. I just don't recommend putting your nose too far into the glass. This is something I'm finding with most of the young inexpensive Irish blends. Their flavor is considerably more delightful than their scent, no matter how they're constructed. So if you're not getting all hoity-toity with your booze and just want something that works well when it hits your lips, Michael Collins isn't a bad choice. It holds water decently, and might (might) stand up to a highball or mixing due to its sweetness.